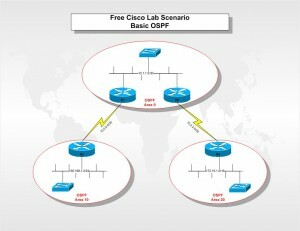 In this Free Cisco Lab GNS3 Scenario I’ll show you how to configure a simple multi area OSPF network using four routers. As per the network diagram we will have 3 OSPF area’s, our backbone area 0, and area’s 10 and 20. Routers R1 and R2 are both known as an Area Border Router’s (ABR) because they are both on the border between two area’s. Make sure you bring your interfaces up with no shutdown. I should say that it’s my first time to visit your blog, however, I can directly say it contains so many useful info.